RWY 35-17. 1000m. Gravel/Grass. Lights. Elv: 2250ft. 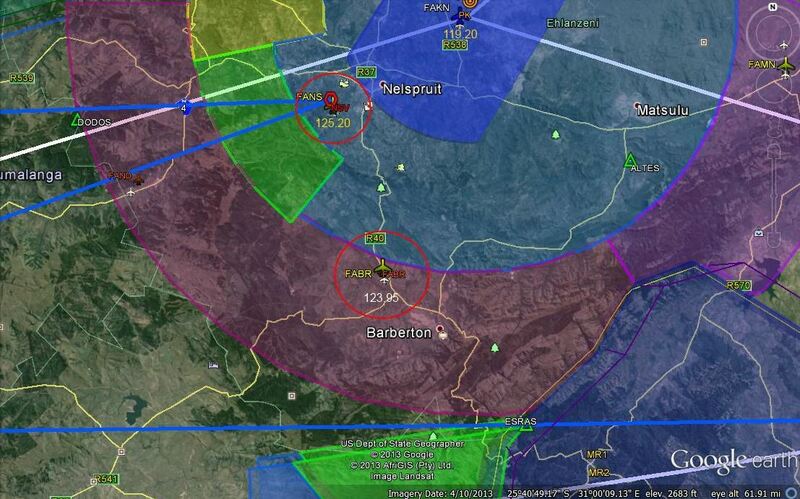 Co-ords:S25º43'051 - E030º58'515 Freq: 123.95 Call sign "Barberton"
Bush Air has relocated to the USA. However CC Pocock still returns to South Africa during the year to give advanced flight training and FAA flight reviews. 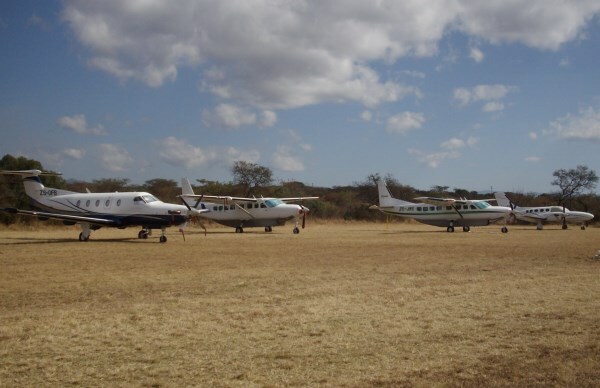 See the BUSH AIR website for more info. FREQUENCY: 123.95 MHz within min 2nm for joining and landing. CALL SIGN: "Barberton". 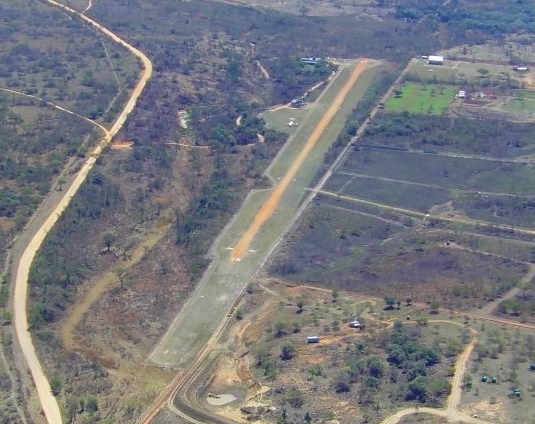 RUNWAY (17 - 35): 1000m x15m. Compacted grass. Lights. Elv: 2250ft. The runway surface is 1000m x 15m (3300ft x 50ft) compacted grass. Runway clearing is 1150m x 50m wide. All landings on RWY 35 and take off's on RWY 17. Microlight strips under the left base for RWY's 17 & 35 - refer to the bottom of this page for more info. The runway is clearly marked and equipped with runway lights. Refer to bottom of this page for Night Operations Procedures. HOLDING POINT RWY 17: Holding area and run-up's only on the Eastern side of RWY 17 threshold. (Look out for the "HOLD 17" sign). MISCELLANEOUS: Advanced flight training and FAA flight reviews conducted by "CC" Milne Pocock of Bush Air . Airfield also available to the Film & TV industry for location, stunts and special effects. Runway 35 threshold is displaced to the touchdown markers by 200m for night operations. All night landings are to be made ONLY on runway 35. Traffic pattern minimum 3500ft asl downwind (Runway elevation is 2250ft at the center). Contact "Barberton" on freq: 123.95 Join overhead at 4000ft then a descending turn to join a left or right downwind for runway 35 at minimum 3500ft. Continue down wind and turn base over the Badplaas road (R38). In the event of a missed approach / go around, conduct an immediate maximum climbing left turn before abeam the tower or the end of the runway and re-enter the downwind for runway 35. Do not continue on the extended centerline as there are powerlines at 2650ft asl .5nm to the north of the 17 threshold and a hill at 3000ft asl 1nm to the North West of RWY 17 threshold. 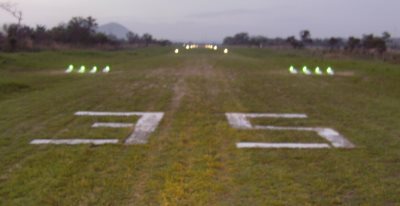 Approach to land only on the runway with green threshold lighting (RWY 35). If threshold lights are red then you are on a dangerous approach to runway 17! All departures to be made only from runway 17. No landing at night without prior permission, a briefing and a signed indemnity form. Contact us to confirm operation of runway lighting & beacon. Land at your own risk and descretion. Airfield is used as a Filming Location. Low level aircraft operations including stunt flying and aerobatics takes place within 2nm radius of the airfield. Occasional use of Explosives / Pyrotechnics and High Power Lasers for Special Effects Purposes for Stunts, Film & TV productions as well as Aerial Pyrotechnics. The above activities can take place any time day or night. Explosives blast sites, aerial pyrotechnic launch sites and explosives magazines are located on the airfield. 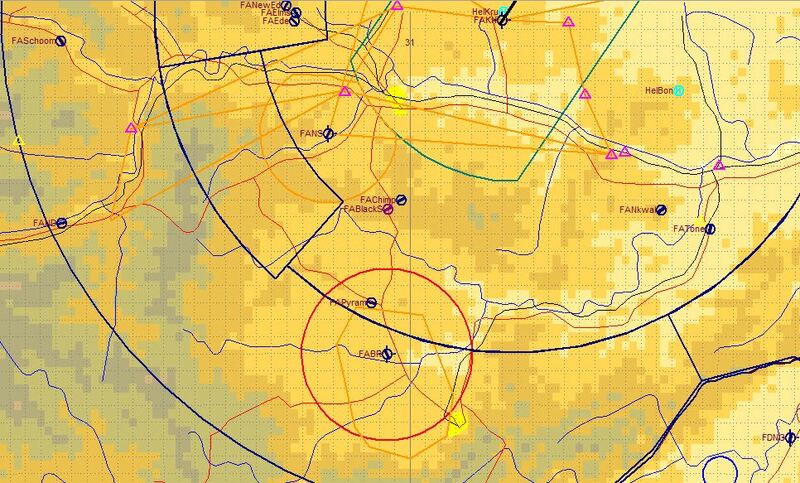 Pilots to call or announce intentions on frequency 123.95 within a 2nm radius if intending to land, operate in the traffic patterns or overhead Barberton Airfield. Microlight strips within the Barberton Airport Traffic Area (ATA). Microlight strip "Jock of the Bushveld" situated directly under the left base turn to runway 17. This strip is located parallel to the R40 Nelspruit / Barberton road. 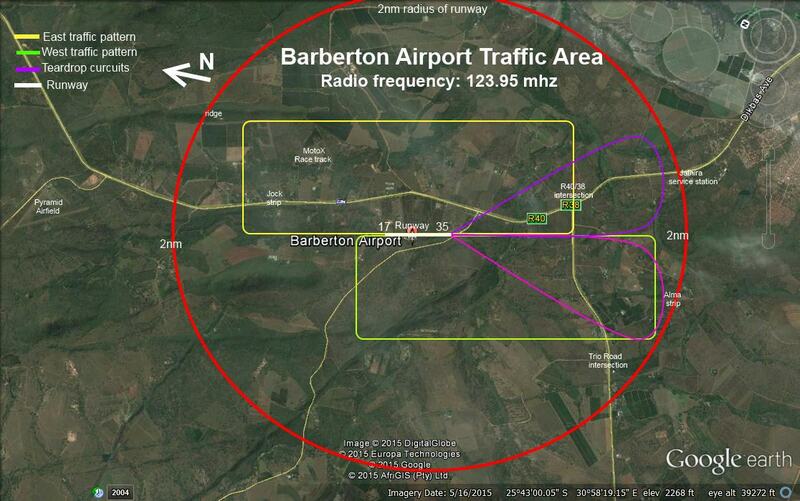 Microlights operating here not broadcasting on Barberton frequency 123.95mhz . Microlight strip under left base sector to runway 35. This strip is known as "Alma" and is located on the southern side of the R38 Badplaas road. Its possition is 1.8nm southwest of runway 35 threshold.